Get ready for the future of email marketing. 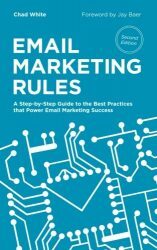 If you value transparency, permission marketing, and having a marketing reputation that will last for years to come….Get this book.I feel like an email marketing expert after reading this book.For example, my church’s emails kept going into my spam folder and I was missing out on updates. On a closer look, they were violating a number of deliverability rules explained in this book, that got them into my spam folder.So I got in touch with them and we are now setting up an consulting appointment. The Foundation of Your Email Marketing This book is the foundation of your email marketing if you are just getting started.However, even if you are a seasoned email marketer this book will add a lot of value to know knowledge.I found this book valuable because it will start by describing the most fundamental rules of email marketing and then will expand them.Plus, what I loved most about Chad’s book is that once you read all the rules, he will show you how they interconnect, in the second part of the book.I would have loved to see more examples of implementation, but maybe that will be a different book on it’s won.I have tons of notes from it, I will try to regularly get back to this book and gift it to everyone who will get started with email marketing (colleagues, acquaintances). The 120 Commandments It took Moses four decades to write his laws, so we should be grateful it’s taken only half that time for someone to codify the rules of email marketing.